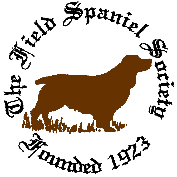 A well balanced, noble, upstanding sporting Spaniel built for activity and endurance. Ideal for rough shooting or as a companion for the country dweller. Not suitable for the city. Conveys the impression of high breeding, character and nobility. Well chiselled, occiput well defined, lean beneath the eyes. A thickness here gives coarseness to the whole head. Slightly raised eyebrows. Moderate stop. Nose well developed with good open nostrils. Muzzle long and lean neither snipy nor squarely cut. In profile curving gradually from nose to throat. Jaws strong with a perfect, regular and complete scissor bite. i.e. upper teeth closely overlapping lower teeth and set square to the jaws. Chest deep and well developed. Ribs moderately well sprung. Length of ribcage is two-thirds of the body length. Back and loin strong, level and muscular. Previously, customarily docked. Docked:. Set on low. Never carried above the level of the back. Nicely feathered, with lively action. Previously,customarily docked by one third. Undocked: Set low. Never carried above the level of the back. Nicely feathered with lively action. Reaches approximately to the hocks. Of moderate length in balance with the rest of the dog. Long, unhurried stride with great drive from the rear. Short stumping action undesirable. Height: approximately 46cms (18ins) at the shoulders. Weight between 18-25 kgs (40-55 Lbs).